To mark the acquisition of the Leonard L. Milberg ’53 Collection of Irish Theater, the Princeton University Library has prepared an exhibition that will feature approximately 220 items from the collection, including first and significant editions of the playwrights’ published scripts, broadsides, manuscripts, playbills, and posters. The exhibition, Players & Painted Stage: The Leonard L. Milberg Collection of Irish Theater, opens Friday, 13 October 2006, and will remain on view in the Main Gallery, Firestone Library, through 1 April 2007 and Milberg Gallery through 18 March 2007. 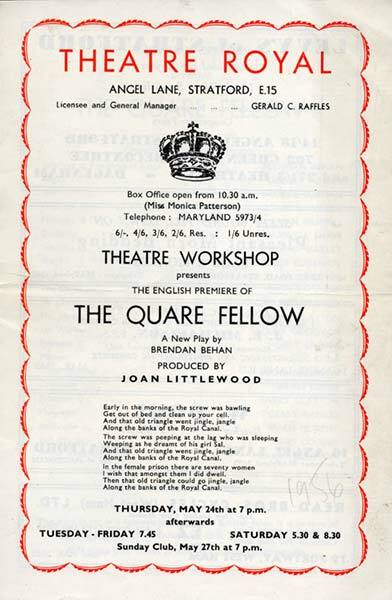 Exhibition highlights include a typescript of “The Cooing of Doves,” an unpublished one-act play by Sean O’Casey that was rejected by the Abbey Theatre and later became the second act of The Plough and the Stars; the original playbill for the 1956 production of The Quare Fellow by Brendan Behan; and the 1952 edition of Samuel Beckett’s En attendant Godot, pièce en deux actes, along with the first French program. Click here to see images of these and other highlights from the exhibition. To open the exhibition on 13 October, Joe Dowling, the Artistic Director of the Guthrie Theater, Minneapolis, will present a lecture at 4:30 in the Stewart Theater, 185 Nassau. His talk will be followed by a reception in the galleries, sponsored by The Friends of the Princeton University Library. To join The Friends and support our libraries, see http://www.fpul.org or contact Linda Oliveir at loliveir@princeton.edu or 609-258-3155. The galleries are free and open to all visitors.